Thank you for contacting us. Please be advised that this unit is designed for Bluetooth, micro SD, and USB only. There is no 3.5 mm port there that we can use for headphones. 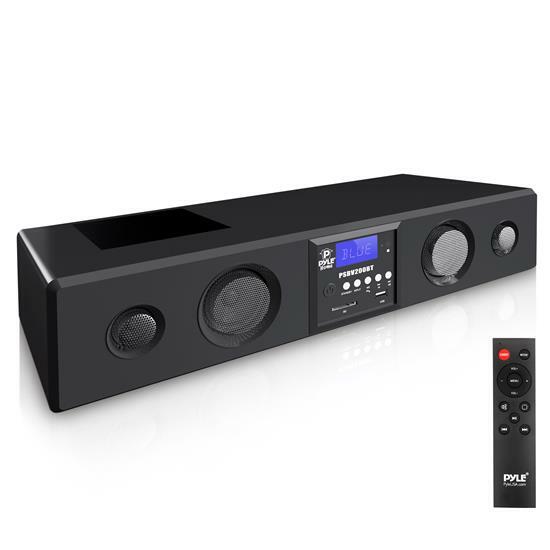 I have this sound bar and love it but I lost my remote control. Is there a code to use with a universal remote? I have an Inteset INT-422-3 Thanks! The PSBV200BT is specified at "300 Watt MAX / 150 Watt RMS", while the input power is 18V*2.5A (45W). How can the output be greater than the input? Input Power is 110v - you use the Wall Power Adapter - DC 18V/2.5A - we provided you. I want to purchase this Pyle Sound Bar and want to connect (4) Bluetooth Pyle PDICBT852RD ceiling speakers to the Sound Bar. Can this be done? Can you combine two inputs together for Karaoke Mode? Music input (Aux1) and Mic input (Aux2)? Please be sure that your TV is connected to the stereo RCA inputs, and please be sure that you are using the TV's audio output. Can this item be paired through bluetooth with a Blackberry Q10? This unit should pair with most all Blueooth compatible devices with search and pair capabilities. Your BlackBerry device automatically detects any discoverable devices within range. what is the best configuration for the surround sound effect ? What is the passcode to connect to a smart tv?